Scientists at the Univeristy of Bern use computer simulations to recreate the forming of planets around a red dwarf's habitable zone. So far, efforts to discover life outside our own Solar System have yet to yield tangible results. Currently, search methods include isolating locations that are ideal for the existence of life. For example, because water is understood to be fundamental to life, planets with large quantities of water are thought to be ideal for extraterrestrial life. Using computer simulations of forming solar systems, scientists assert that most Earth-sized planets with abundant water are found in systems around red dwarf stars. If you’ve ever heard the child’s tale Goldilocks and the Three Bears, you know that Goldilocks experimented with the bears’ porridges until she found one that was just right. 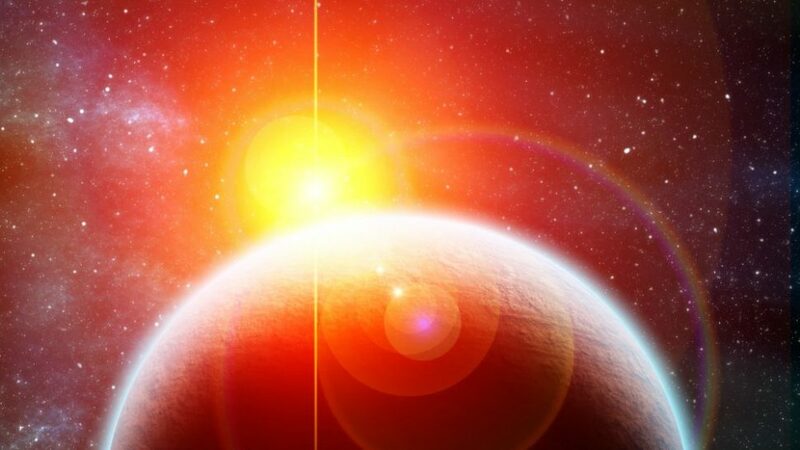 Depending on the strength of a star, a planet hoping to sustain life would have to be at just the right distance from its host star, or in the “Goldilocks Zone“. Too far away and the planet freezes over; too close and the planet becomes a pressure cooker. The “Goldilocks Zone” or “Habitable Zone” is the distance from a host star where a planet could possibly support life. “Habitable or not, the study of planets orbiting very low-mass stars will likely bring exciting new results, improving our knowledge of planet formation, evolution, and potential habitability – Willy Benz. The nearest star to our Solar System, Proxima Centauri, is actually a red dwarf. Like most red dwarfs, Proxima Centauri is a low mass star. It is ten times smaller than our Sun and burns almost 500 times less bright. Earlier this year, a planet the size of Earth was found orbiting within the habitable zone of low-mass star, Trappist-1. Later, in August, scientists discovered another Earth-sized exoplanet orbiting in Proxima Centauri’s habitable zone. These two discoveries led astronomers to surmise that low-mass red dwarfs may have a relatively high population of these planets. The two discoveries prompted Yann Alibert and Willy Benz at the Swiss NCCR PlanetS and the Center of Space and Habitability (CSH) at the University of Bern to conduct computer simulations of the formation of these solar systems. The computer simulations generated planets similar to those discovered near Proxima Centauri. Such planets were small in size – within the range of 0.5 and 1.5 Earth radii. Curiously, almost all of the simulated planets were comprised of more than 10 percent water compared to Earth’s .02 percent. Such planets would have massive oceans with ice cores formed by immense pressure. While water is essential for life, too much water might only support single-celled organisms, or none at all. “Habitable or not, the study of planets orbiting very low-mass stars will likely bring exciting new results, improving our knowledge of planet formation, evolution, and potential habitability,” says Benz. Let John N know how much you appreciate this article by clicking the heart icon and by sharing this article on social media.